1AV Image Converter is a image file converter that converts image files to a wide range of image file formats. Input formats are: JPG, PNG, GIF, BMP, TIF, TIFF, and ICO. Output formats are: PDF, PSD, BMP, DPX, GIF, ICO, JPG, J2C, J2K, JP2, PAM, PBM, PCX, PGM, PNG, PPM, RAS, RGB, SGI, TGA, TIF, TIFF, WEBP, XBM and YUV. The program is very easy to use. There is practically no learning curve. It is one dialog in which the user adds the files to be converted, selects the output image file format, tunes the output parameters, apply effects such as scaling, rotating, flipping, image watermarking and text watermarking, and then converts the files. It is very simple to operate. The program comes with last memory so no need to re-configure anything. The user can tune the parameters of each output format. Each extension has its conversion parameters so that the user can have full control and end up getting what he or she needs from the conversions. 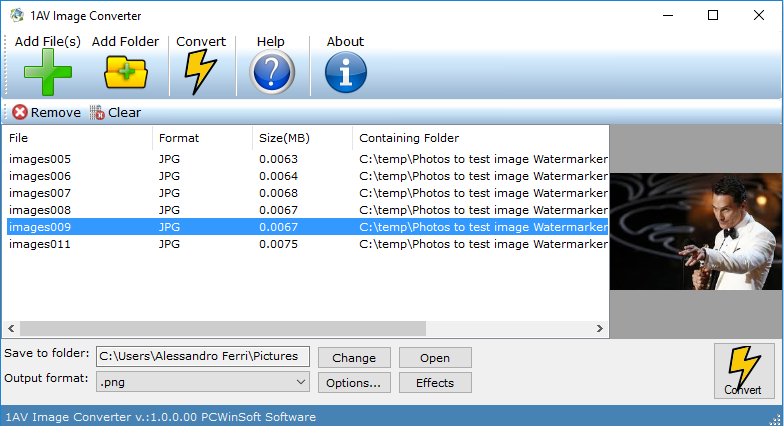 Effects such as rotate, scale, flip, watermarking text and images are supported. You can choose to apply one effect or two or all or none. The ability to apply effects complements this image file converter.